Just a ‘thermal’ issue: is the auto industry getting lax about spontaneous combustion complaints? It took the quick-thinking of a good samaritan for a Nashville city official to escape his burning Kia in the nick of time. “Hey, there’s fire coming underneath the car,” Nashville City Councilman Jonathan Hall recounted a passing driver shouting at him on the highway. Hall told local news that he pulled over, jumped out of the car, and heard a “boom” sound shortly after. In Denver, Cindy Titus thought a case of road rage was prompting a truck driver to abruptly cut in front of her and slam on his brakes. Then the brakes and steering on her 2013 Kia Sorento suddenly failed. She realized the truck driver was trying to give her a warning. “My car was on fire,” she recently recounted to her local news channel. She grabbed her dog and got out. The disturbing story of a man who died in another Kia last year in Cincinnati shows what could have happened if those warnings didn’t arrive in time. Carol Nash’s son Keith borrowed her 2014 Kia Soul to go grocery shopping. In the apartment parking lot, she later told reporters, she heard the sound of an explosion. Keith couldn't open the doors; his brother said that they had automatically locked themselves shut. The family says that Keith burned to death while trapped in the vehicle. For consumers, such encounters are terrifying and, in the Ohio case, deadly. But for Kia and Hyundai, the two automakers whose cars have been hit with what safety groups say are a disproportionate amount of spontaneous fire complaints, there’s no reason to panic. “KMA recognizes that customer safety is paramount and is committed to addressing every thermal incident,” the company said last month. The brands have previously recalled some of suspect vehicles over engine issues, but the recall notices issued last year didn’t mention the spontaneous combustion complaints. “There was no reference to the word fire or even ‘thermal event’ which is their favorite way of saying it,” says Jason Levine, executive director of the Center for Auto Safety, the safety nonprofit that has taken a lead in identifying complaints about the Kia and Hyundai cars. And the subsequent repair work on the cars recalled for engine problems didn’t make the fire complaints go away; the Center for Auto Safety has now counted nearly 250 complaints describing fires that ignited without warning in the Kia or Hyundai vehicles, an increase of 85% from when the nonprofit first warned consumers about the problem earlier this year. The group says that 103 additional complaints were filed to the National Highway Traffic Safety Administration (NHTSA) between June and October and is continuing to demand that Kia and Hyundai recall a total of 2.9 million vehicles. In response to the safety petition and complaints, the U.S. Senate Commerce Committee invited the CEOs of both companies to testify on November 14; neither agreed. The Senate Commerce Committee ultimately opted to delay the hearing. A new date has not been set. “Discussions among the committee and two auto manufacturers about participation at a future date remain ongoing," a spokesman for the Commerce Committee said of the postponement. Leave it to Tesla fanatics to publicly debate whether a car randomly catching fire is a valid thing to complain about. It started with a post last June from actress Mary McCormack, which described her husband’s frightening ordeal in his Model S in Los Angeles. “Thank you to the kind couple who flagged him down and told him to pull over,” McCormack wrote on Twitter, accompanied by a 45-second clip of the flaming Tesla. The results of that investigation are not publicly known; the incident quickly disappeared from headlines, and Tesla’s press team has not yet responded to messages from ConsumerAffairs inquiring on the results. In absence of a formal investigation, some outlets like MarketWatch deflected to “Black Swan” author Nassim Taleb, a Tesla owner who wrote a post on Twitter claiming that McCormack was being “emotional” about her husband's car catching on fire. But experts say that while rare non-collision fires aren’t unique to any particular car brand, that doesn’t mean such incidents are acceptable. In England, a BBC Investigation documenting a tendency of some Ford EcoBoost engines to heat and catch fire was quickly followed by a promise from Ford this October to give refunds to all consumers who reported the problem. Later that month, BMW announced a recall of 1.6 million diesel cars from the years 2010 through 2017 over fluid leaks that could cause fires. And in December, Chrysler recalled 10,021 Pacific Hybrid plug-in vans over a defect that it said could cause engines to stall and catch fire. Those are just examples from the last two months alone. 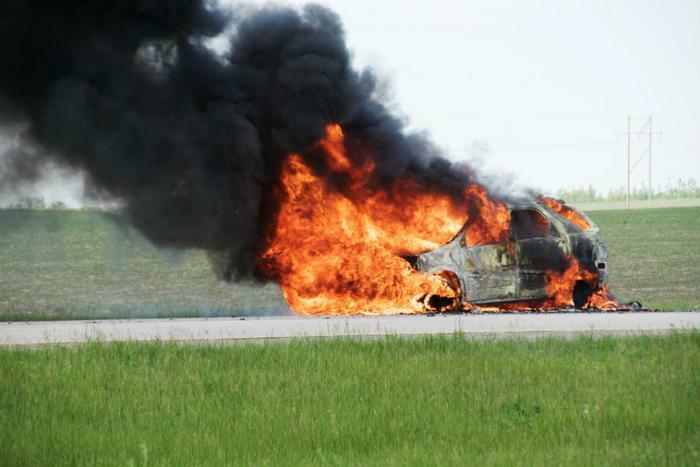 It's not necessarily that vehicle fires are getting more common. United States regulators say that emergency responders put out an average of 152,300 vehicle fires every year, though the figure isn’t broken down into whether there was a prior collision. Despite Hyundai’s suggestion to examine the fire rates of all brands, The Center for Auto Safety and other watchdog groups aren’t tracking every car that may be prone to a non-collision fire. That would be a hefty task. They say they are focusing on Hyundai and Kia cars precisely because of the relatively high volume of complaints coming from consumers about the same makes and models, demonstrating what they argue is a clear pattern. Another concern that the Center for Auto Safety points to is the testimony from consumers who have reported their electronic locks failing in the potentially defective cars, which threatens to trap them when the fire breaks out, as allegedly happened in the Ohio case. “We have definitely seen reports of people of their car is on fire and they can’t get out, or it is difficult to get out. That would also, to us, lead to another reason to look into this," Levine tells ConsumerAffairs. As several major cases in recent years show, an unchecked defect linked to a vehicle fire can have far-reaching consequences. BMW, Ford, and the federal government are currently embroiled in a lawsuit over a 2002 Ford Escape that caught fire on a container ship in 2015, causing an estimated $100 million worth of damage to other cars on board and destroying the ship. The Escape had been under recall over fuel problems that Ford warned could ignite fires, even when the car was turned off. But the National Transportation Safety Board (NTSB) determined the Ford’s owner, a USDA employee who was having her car shipped back to the United States, never received the notices because she was working overseas. The case highlights what advocates say is a need for recall notices to go digital. Last year's Carr Fire in California, the state’s sixth-most destructive wildfire of all time, was reportedly ignited by a car with a flat tire. The lawsuit argues that more cars, including the BLM employee’s Jeep, should have been included in that recall. “Vehicle fires are very complex and often occur for reasons that have nothing to do with the vehicle involved,” Jeep said in response. More recently, a couple in Minneapolis provided footage to ConsumerAffairs showing their brand new Toyota RAV4 catching fire while it was turned off and unattended. The car exploded shortly after, injuring a first responder on the scene. A fire department investigator said that the fire was “an extremely strange occurrence” that he had never documented before. The fire ignited from the interior of the vehicle, not the engine, as is more typical in non-collision fire cases. Toyota in that case told the couple that an aftermarket tow hitch they installed may or may not have ignited the fire, and otherwise said the cause would be left undetermined. The tow mechanic says that he has never heard of tow hitches causing cars to explode. “Manufacturers who fail to properly design vehicles, and fail to ensure that fire risks are addressed promptly, are putting a lot of lives -- in addition to the lives of the owners and their passengers -- at risk,” Rosemary Shahan of Consumers for Auto Reliability and Safety tells ConsumerAffairs. Meanwhile, the complaints about fires in Hyundai and Kia cars have been filed to regulators on a steady basis for the past five months, advocates say. NHTSA is currently launching an investigation of its own, though that one also focuses on engine problems rather than the fires specifically. The investigation has been ongoing for months. “I’m not sure that we're seeing the urgency that we would like to see from NHTSA with respect to something that is so dangerous, at least publicly," Levine adds.